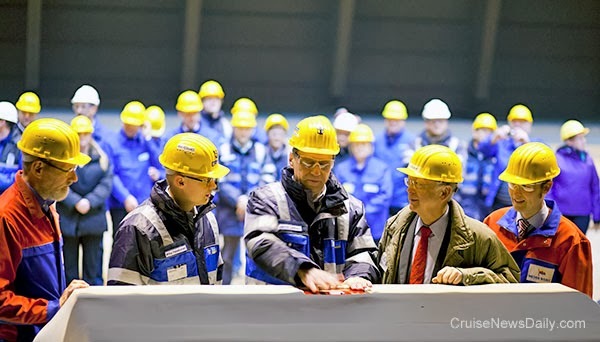 Meyer Werft laid the keel of Anthem of the Seas yesterday (November 19, 2013) at their Papenburg yard. Shown here is the first block which was lowered into place by Meyer's 800-ton crane. It was the first of 74 blocks, measuring 59 by 121 feet and weighing 620 tons. The 167,800-gt Anthem of the Seas will carry 4,180 passengers (double occupancy). Anthem is the sister to Quantum of the Seas, which will be delivered in the fall of 2014. 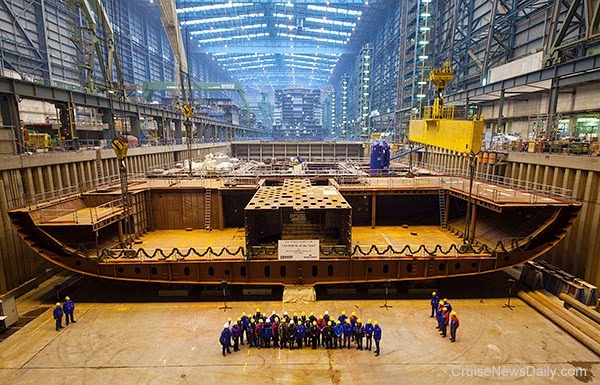 Anthem of the Seas is scheduled for delivery in the spring of 2015. Last week Norwegian Getaway left Meyer Werft, and we showed you pictures. It was an unusual river conveyance to be sure, with a nighttime departure (to coincide with the tides) from the yard at 1am, an even-larger ship having to ease through the narrow passages, and fog virtually all the way. 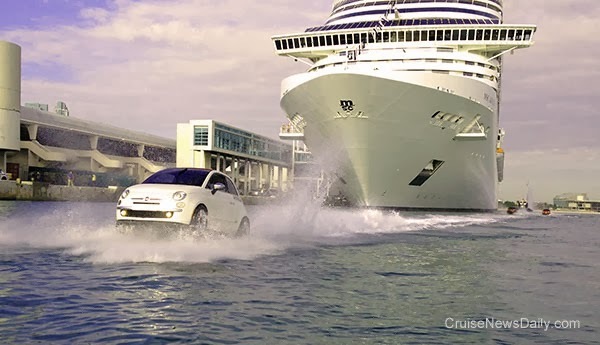 Meyer Werft has now released a video of Norwegian Getaway's journey from the yard to the sea. Get ready for a change. MSC Divina arrived in Miami this morning at the end of an 18-day cruise that repositioned her from Venice to her new year round home port in North America. 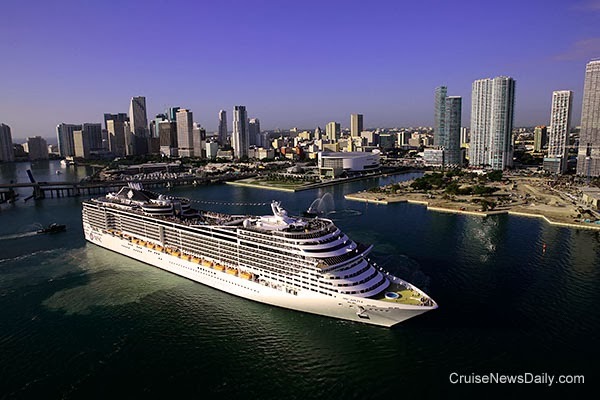 MSC Divina arrived in Miami early this morning after its 18-day transatlantic repositioning cruise from Venice. 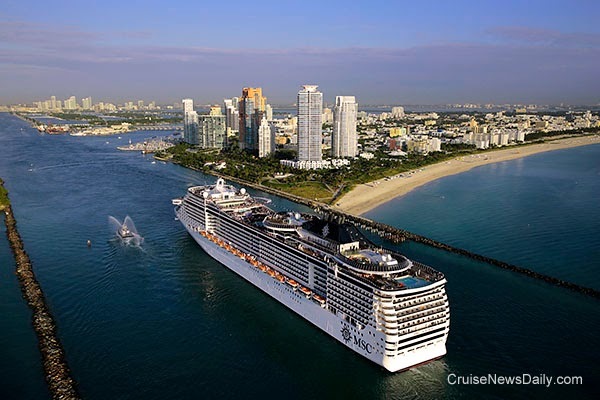 Miami will be the ship's year round home port, and it is the first time MSC has based a ship of this size in the US. 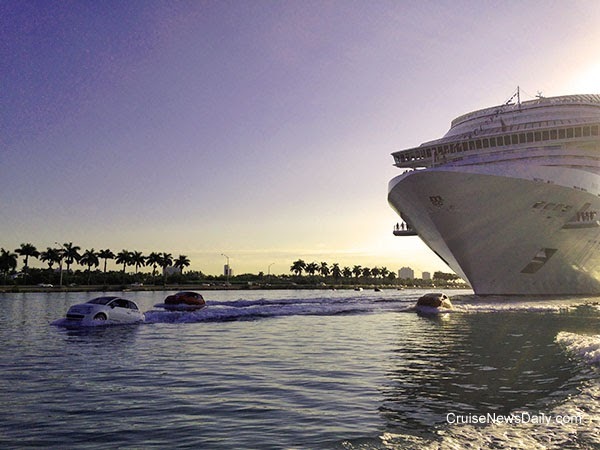 MSC Divina was met in Miami by a fleet of FIAT 500 personal watercraft which seemed to enjoy buzzing around the ship during its entry into the harbor. Photos courtesy of MSC Cruises USA. May not be copied or reproduced without permission. 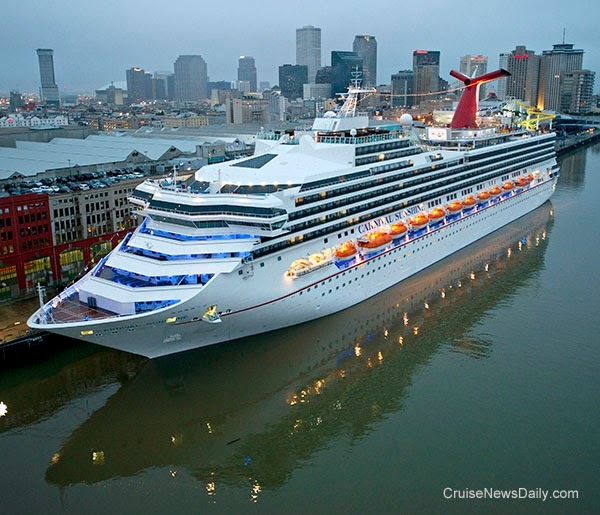 Carnival Sunshine was christened yesterday in New Orleans and left this afternoon on its first cruise from its new home port. Last month, voters in Key West defeated a measure on the ballot that decided whether or not to move forward studying a project that would widen and deepen the channel into the port. Without the enlargement, cruise ships of today’s average size cannot get into port. The measure was defeated, but new comments from those opposed seem to show some flaws in their logic. 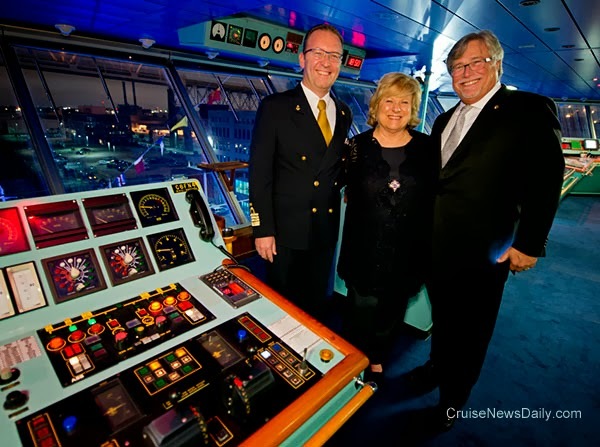 Carnival Sunshine was christened last night (November 17, 2013) in New Orleans, and its godmother is a woman who has been there throughout the life of Carnival Cruise Lines, Lin Arison, the wife of Carnival's founder, Ted Arison. 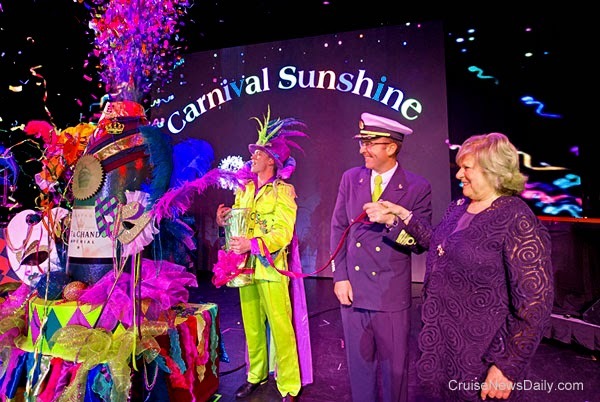 Confetti flew when Mrs. Arison pulled the cord to christen Carnival Sunshine while Capt Giuseppe Giusa looked on. 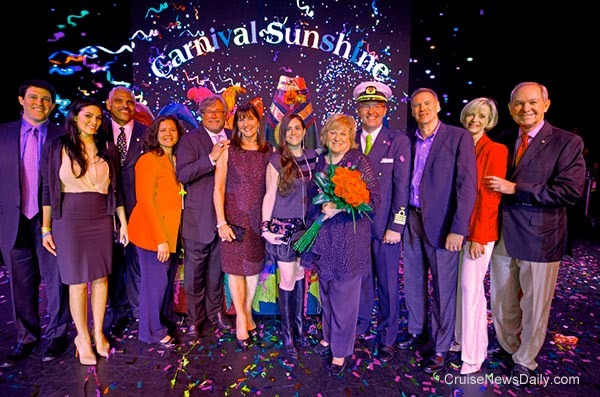 "Family" photo of Mrs. Arison and Capt Giusa with Carnival executives and their spouses. Photos courtesy of Carnival Cruise Lines.